On the 45th anniversary of the launch of Apollo 17, the last mission to take humans to the surface of the Moon, commercial space company PTScientists formally pledges that it will respect this site of incredible historical interest. Announcing a partnership with For All Moonkind, Inc., PTScientists is making a public pledge of support for their initiative to safeguard sites of historical and cultural significance on the Moon and elsewhere in outer space. In a human first, PTScientists – working with Key Technology Partners Audi and Vodafone Germany – will revisit the Apollo 17 landing site during Mission to the Moon. This is the first time any organisation – private or public – has planned to return to any of the historic landing sites on the Moon. The team hopes to capture the first high-definition images of Apollo 17’s lunar roving vehicle, which was left on the Moon by astronauts Harrison Schmitt and Gene Cernan in 1972. Since Cernan and Schmitt left the surface of the Moon on 14th December 1972, no-one has seen the lunar roving vehicle (LRV) clearly. Grainy images from NASA’s Lunar Reconnaissance Orbiter show signs of what is believed to be the LRV on the Moon’s surface, but no-one can tell how well the Moon buggy has survived decades of radiation exposure, lunar dust, and extremes of temperature. Recognising the historic and cultural significance of the Apollo 17 landing site, PTScientists has been working with engineers from NASA specifically to assure Mission to the Moon does not damage any important human heritage. This experience highlighted the need for a wider conversation on protection and preservation of site, and how this should be covered in a formal legal framework to ensure the protection of all human heritage sites in outer space for future generations. For All Moonkind is an international citizen-based not-for-profit group working to develop and implement binding international law designed to manage the preservation of humankind’s heritage in outer space starting with the Apollo landing sites. “Each of the Apollo lunar landing and similar sites in outer space, including, for example, Russia’s Luna sites, are a fundamental part of our human heritage” said For All Moonkind Co-Founder Michelle Hanlon. PTScientists is one of the first private space companies to support the For All Moonkind initiative. 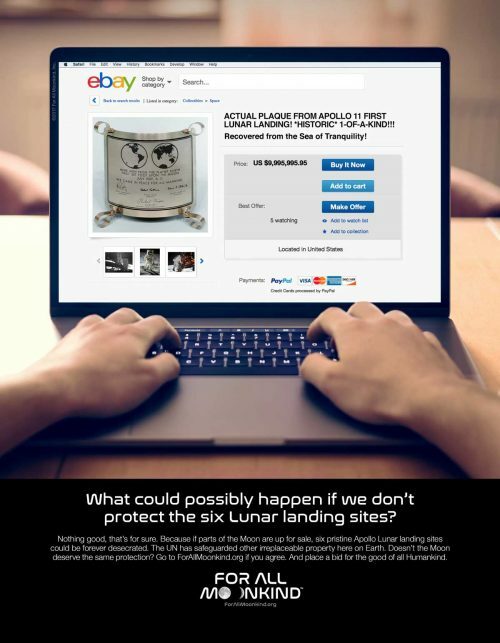 The company has endorsed the mission of the organisation and is helping to spearhead an initiative to encourage all organisations in the space sector to sign a binding pledge to respect the lunar landing sites and all our human heritage in outer space. PTScientists is a German private space company, headquartered in Berlin. Their first lunar mission, Mission to the Moon, aims to send two Audi lunar quattro rovers to the lunar surface, to the Taurus-Littrow Valley. Using one of the rovers the team will carefully approach the site of the original lunar roving vehicle, and will work closely with NASA to ensure that they don’t disturb any sites of potential interest for the future. They aim to be the first private mission to land on the Moon, and plan to launch in 2019 – which is also the 50th anniversary of Apollo 11 and the first humans on the Moon. 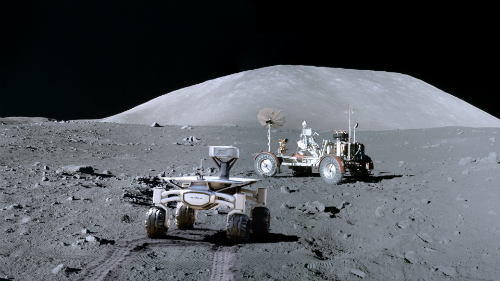 The lunar roving vehicle has been on the Moon for 45 years, undisturbed. It is hoped that valuable data can be collected about the presence (or absence) of dust, whether the vehicle is still in one piece, and how well various materials have stood the test of time in the harsh environment of space. This information could be useful when considering which materials to use for future long duration missions. Apollo 17 was the final mission to send humans to the lunar surface. It launched on 7th December, 1972 with three astronauts on board: Gene Cernan, Harrison Schmitt and Ronald Evans. Astronauts Cernan and Schmitt landed on the lunar surface on December 11th, carried out three Moon-walks, and launched from the surface of the Moon on December 14th. Gene Cernan was the last person to step on the Moon, but before his death in January 2017, shook off the term “Last Man on the Moon” saying he was just “the most recent”. Apollo 17 splashed down in the Pacific on December 19th, 1972.